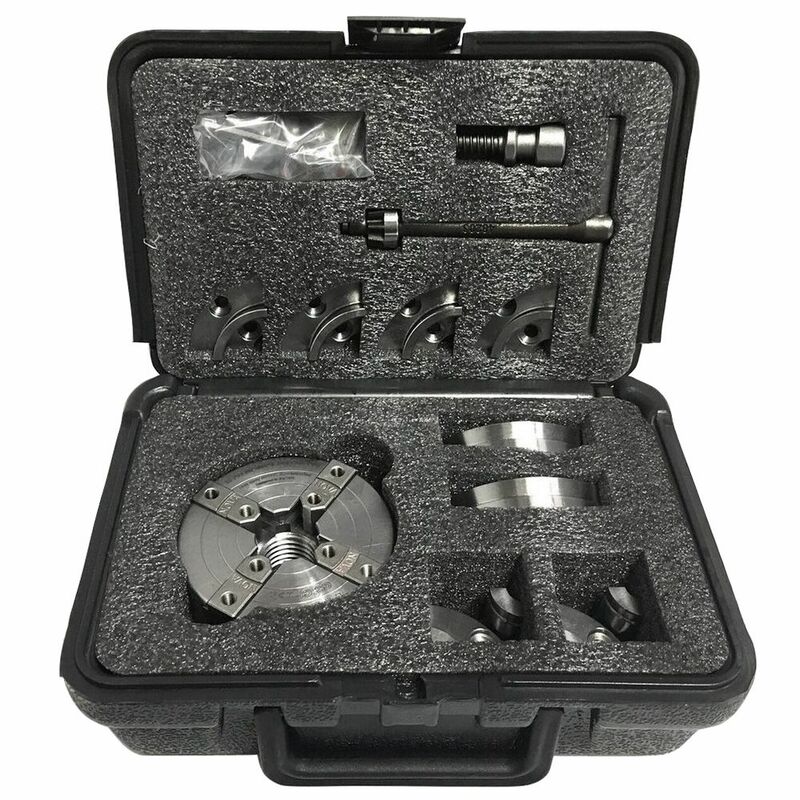 Limited edition package includes the G3 Chuck with standard 2'' jaws, plus two bonus jaw sets—4'' jaws and pin jaws—all presented in a sturdy storage case, a combined value of $354.96. Offering solid construction, minimal vibration and ease-of-use, the Nova G3 has become a favorite chuck for small and mid-sized lathes. 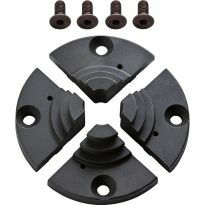 It is offered here in a value package with two extra sets of jaws—4'' jaws and pin jaws—in addition to the standard 2'' jaws. 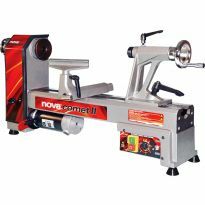 Though designed for the Nova Comet II Midi Lathe (#46457, sold separately), it can be used on any lathe with a 1'' x 8 TPI thread. When used on non-reversing lathes, the set screw must be removed. 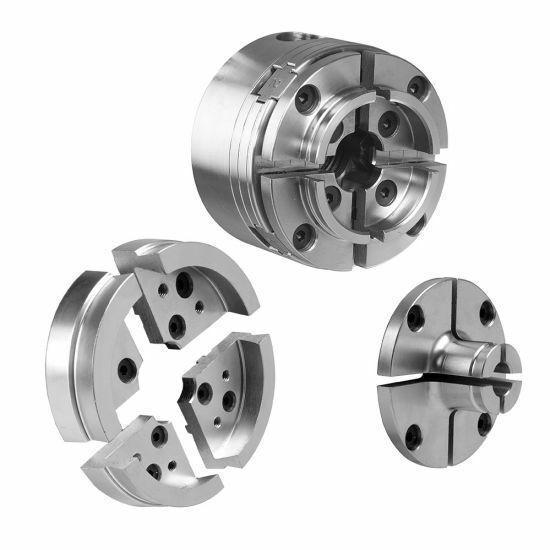 The G3 is a self-centering chuck, so all four jaws close at the same time by turning a single key. With only one hand needed to close the chuck, your other hand is free to align the stock. At just 1.79'' long, the compact G3 helps to maximize your distance between centers, and reduces stress on the spindle. This is not an insert style chuck. Cannot use an insert/adapter to change the threading. Package includes two extra sets of jaws—ideal for bowl and spigot turnings—plus a storage case! The included JS100N 4'' Jaw Set is designed for expanded dovetail or reverse dovetail use. Ideal for gripping footed bowls and mounting custom wooden jaws. The included PSPIN extended pin jaws expand into a pre-bored hole, especially useful for bowls with a free form edge. The long jaw length allows for a powerful spigot grip for work up to 6'' in length. Dovetail allows mounting small bowls up to 6'' in diameter. Both grip firmly in both contraction and expansion mode. Only use authentic Nova accessories on your Nova chuck. Using non-genuine Nova accessories and copies of accessories could lead to operation and safety issues and will void the warranty. Nova accessories are designed for use only on Nova chucks. Do not use on any other chuck. Perfect fit and easy to install. Exactly what I expected. Has everything I wanted for someone who is new to turning. Good quality and good value. Thanks! My son has just started in woodworking and loves it. Great and very versatile tool. Great for my beginner work in turning. Quality is superb. This is my second one chuck, will probably get the same when I need a third. Not a fan of changing jaws. I have a variety of chuck sizes....honestly, I don't like changing the jaw sets (I'd rather be turning), but if you are limited in the number of chucks, this is a great single chuck or addition. The Nova G3 works very well with my Delta midi lathe and it is very solid. Nice set, three sets of jaws are easily changed, a size for all jobs. Heavy, feels very solidly built - good quality. Use them with every project. I have used my g3 chuck for about 21/2 years and like it much better than another brand of chuck I have access to. I am new at lathe work, but I really like the Nova Chuck. I have watched videos on ways to use it. It took some time to find the right attachment for my Shop Smith. It secures the project much better than the old style center chucks. I made a box out of mulberry, and the Chuck was very helpful. I am now working on my lathe gouges. I have wanted one for some time, love it! Awesome buy. Works perfect on my lathe and very easy to set up. 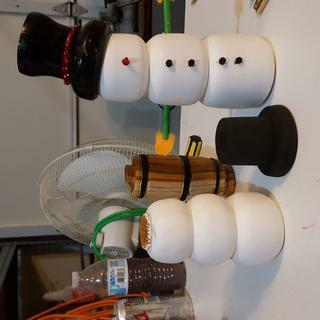 Tried it out making a simple snowman on the first use. Took just a minute to mount wood and get turning. I turn segmented vases and boxes and this is the real go to tool. New to turning, this was my first chuck set. Very pleased so far, good machining and design. Great value etc etc. I love this chuck. Especially the one handed key. Don't buy anything until you own this has set!!!! The best buy you can make!! Works great and solid construction. 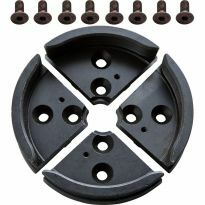 Remarkable price for medium chuck system. Good set of chucks and come jaws. This was perfect for me and the pieces I make. Exceptional value for light, medium work. My first nova purchase and it’s a good one. I didn’t know the quality I was getting and this item shows why it’s most popular. Easy install and set up, no matter what jaws your using. Solid grip that leaves you sure and positive about the wood holding while turning. Excellent choice and I highly recommend it. Wonderful tool. Did exactly what it said! Love the extra jaws! Came well backed & prompt! Used it several times and very pleased. Used both the small jaws and larger ones. Stock insertion and jaw tightness are critical for properly balanced turning. Incidentally, been a woodworker for 60 years, but new to turning. Suprisingly easy to use. Had get adapter for my .74 inch lathe to the 1inch on the chuck,. But it works very good ! Should have bought years before !! 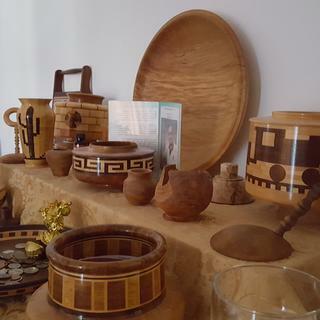 I'm very satisfied, good quality, a wood turners must have. I have used several times now and it does a great job. High quality. Much improved over an older model I had on another wood lathe. Just getting into turning. This was a great buy! This chuck is very versatile. Great addition to lathe setup. Nova equipment I consider way above any other chuck. I thoroughly enjoy the chuck. It handles everything my Wen Lathe can take and makes gorgeous work from it. The chuck arrived in fine shape. Well made and smooth operation. Can’t wait to try it out. Very pleased with the chuck,the price and the speed of delivery. Love it works well on my lathe,for small piece of work like I do.Just for crafts. If you didn't get in on this deal you really miss out. However, at any price, this is a great deal. Easy to use, Packaged well, very easy to set up and get going. Quality quality quality! Always wanted a set like this for my lathe but did not want to spend the money. Wow! Made wood turning for me even more fun and much easier! This went up for $159.00 and i could not pass it up. So glad i bought the kit. Everything came very nice and packed tight in a very nice padded hard case. Nova has hit a homerun with this package deal. Thanks! Nova looks to be a good product and I needed a chuck for my hobby. The Nova G3 is a good size chuck for my mid sized lath the this bundle was a very good value. Good bundle and I need a second G3 chuck to speed transitions from one process step to the next.I will leave my Pen Plus Jaws on one chuck for quick pen blank drilling. The other will be for other project work. I got a new lathe & heard Nova was a good brand. Great value, big savings over purchasing the parts separately. One of the only places who has it left in stock and for a reasonable price. looks like the best buy. perfect for the Harbor Freight mini lathe i just purchased with the MT2 1-8 tpi spindle. 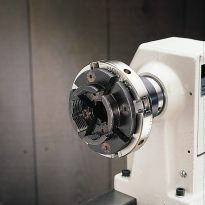 I have been researching lathe Chuck's for some time and this is a good deal! Is versatile and can be used for multiple applications. recently got into pen turning and my lathe doesn't have the right chuck. figured I'd go with a well reviewed (albeit expensive) option. Looking to purchase a chuck- this seems like a good deal for a full kit. Excited to try this out!!! I already own a Nova G3 chuck with 2" jaws and find it to be a good quality chuck. I needed smaller and larger jaws and this seemed like a good deal. The two sets of jaws would of cost me over $100 alone. Plus with two chucks, I'll save a lot of set up time when I want to turn different sizes. Should work well for my beginner lathe working. From taking to some of my friends who are woodturner the Nova G3 is top of the line. This bundle on sale is a great deal. So I ordered one. looking forward to using it. Want to try it out and see if it's any good. I needed the reversible chuck for the nova lathe. it was a good deal, price wise. free shipping, yah! Great value and goes along with my other Nova Chucks and jaws. A good value with good reviews. I have a jet mini lathe and needed a chuck. New to turning and this chuck had the best reviews for the price. Looking to buy a Nova lathe. Good price on a kit to get my son turning more items. Read input from other buyers with good response. 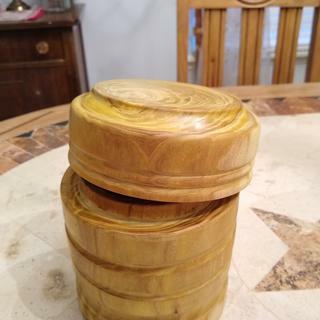 Good deal for the bundle and I want to start turning bowls. Excellent value for the price. 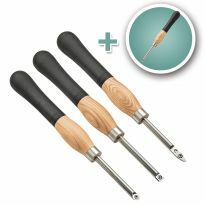 I compared to several other woodworking suppliers and found that Rockler had the best price. Of course, that was before I was charged $16 for shipping. Oh well, I just chalked it up to supporting smaller businesses. Bought these for my harbor freight lathe. Every thing I have read and measured they should fit. I have a jet midi and this will give me more options for different things and I don't have to have an additional insert. thanks for the savings. seems like a good deal and a case. I have read the reversible feature its not to be used on the Jet 1221vs. Does anyone have more detail on this issue? BEST ANSWER: I have the same lathe and and chuck and haven't had any problems using reverse, just make sure you securely tighten the set screw located on the base of the chuck. Will this chuck work on my excelsior mini lathe? BEST ANSWER: Yes, this chuck and Excelsior lathe both have a 1" x 8 TPI thread. will this chuck take an insert adapter (3/4" x 16 tpi spindle)? BEST ANSWER: Yes, but Nova does not carry one. They are available from other sources. Does this chuck set work and work well on a Jet 1221 VS lathe? Rockwell lathe has a 7/8 X 13tpi spindle. Would an ifadapter be available to use the G3 chuck? BEST ANSWER: Would a female 7/8X13 tpi with a mail 1" addapter be available for this lathe? I have a 12" × 26" central machinery wood lathe with reversable head will the nova chuck work on this lathe? BEST ANSWER: Worked perfect on my central machinery. Zero issues here. So yes it will work. You should have 1"x 8 tpi same as mine. You will not regret buying this chuck set. If you do not have reverse you will have to remove the set screw. If it is 1 x 8 tpi yes .. i have the bigger version central machinery and it worked flawless. Will it fit on my Ohio forge wood lathe? BEST ANSWER: This chuck will fit a lathe that has a 1" 8TPI head stock thread. does this interchange with a nova 2? Do you still need to purchase a face plate? Or does this cover what a faveplace does as well? BEST ANSWER: The chuck will be very helpful for most situations, but if you are turning something very large, such as a wide platter or awkward size, a faceplate can be very helpful as it is more secure. Then as you shape one side, you can switch to the church after turning a tenon or recess. So the chuck does not replace the faceplate; they augment each other. A faceplate is always a good idea to have. The chuck will be used once you have a recess or a tenon to granb onto. The faceplate is often what you will use to get to that point, especially when turning a bowl. I love this chuck. It performs really well for me. It does come with a worm screw. I almost always use the worm screw instead of a faceplate. however, there are a few situations where a faceplate would still be useful. I wouldn't use this in an application where a face pale is normally used. Will this chuck work on a full sized lathe? Shane, I use it on a Jet 1236 and it works great. Will this fit my shopsmith mark v? BEST ANSWER: This was a confusing issue for me, and took me a bit of time to research, so I hope this helps someone else who owns a Shopsmith. 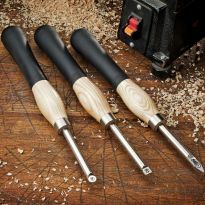 The Shopsmith Mark V has a 5/8" non-threaded spindle that uses a set screw to lock tools in place. Therefore you need an adapter to use NOVA G3 chucks on your Shopsmith. NOVA, confusingly, makes two different versions of it's G3 Chuck. (An explanation of the differences can be found in the FAW on the NOVA web site). For the G3 Reversible Version Chuck (NOVA 48232) that comes in this 30th Anniversary G3 Kit you'll have to go to a 3rd party to get an adapter that connects the Shopsmith's 5/8" spindle to the chuck's 1" x 8 TPI threads. As Dennis mentioned above, Penn State makes just such an adapter, the PSI L5818. Hurricane Turning Tools also makes one. I don't think Rockler has an adapter such as this. NOVA also makes another version of the G3, that is NOT available in a 30th Anniversary Kit. They call it the Insert Version G3 Chuck (NOVA 48202). This version of the chuck has 1 1/2" x 8 TPI threads. NOVA does make an adapter for the Insert G3 Chuck (NOVA ISNS 71029). Rocker carries an adapter like this (Nova Insert/Adapter, 5/8" Plain Bore, Rockler Item # 43743), but it will ONLY work with the Insert version of the G3 Chuck, NOT the Reversible G3 Chuck found in the 30th Anniversary Kit. To the best of my knowledge, Shopsmiths do not have a threaded spindle. The Nova insert model would be better suited as the carry an insert with a 5/8" bore designed for Shopsmith. 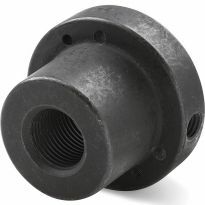 There is an adapter available from Penn State to convert Shopsmith spindles. I have a Shopsmith Mark V and use a Nova G3 chuck! All you need is the 5/8 to 8tpi adapter (about $25 from Nova or Rockler). I use the 2" jaws a lot and really wish I had the 4". Buy this, you'll love it! I don't know the answer. However Rochler sells a variety of adapters ad does Penn Industries. Will this fit on Rockler’s Excelsior Mini Lathe? BEST ANSWER: As in the Rockler item description, "it can be used on any lathe with a 1" x 8 TPI thread". So yes, it will fit the Excelsior Mini Lathe. 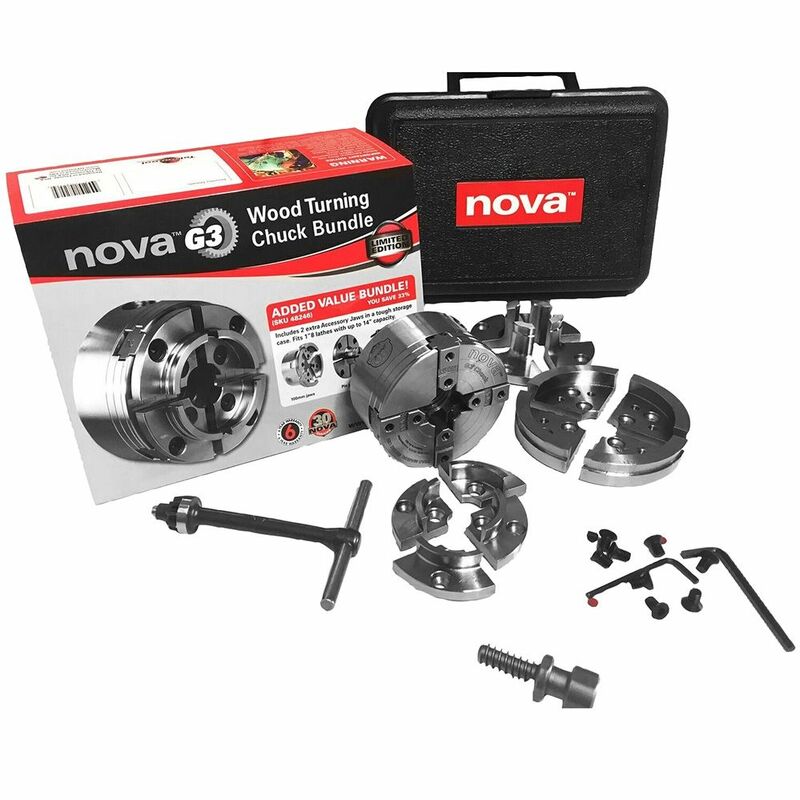 The Nova G3 Reversible Chuck is a great product... perfect for mini and midi lathes. This set comes with 1X8 tpi already threaded, the Excelsior has a 1x8 tpi spindle, so you shouldn't have any problems, it should screw right on. I have an old Craftsman lathe (model 113.228160). What adapter would I need for this Nova chuck to work? BEST ANSWER: Sorry I was incorrect about what you have on your lathe. It should be 3/4"-16tpi When you measure to verify. when you measure the pitch on the thread , top of one thread to the next. It will be 1/16th of an inch or .062. If that is what is on your lathe then you need Lathe Threaded Spindle Adapter Bushing 3/4-16 to 1-8 To Mount Chucks To Spindles. I could not find it on Rockler's site. It is available on other sites if you google the it. I am guessing you have the 3/4-10 spindle on you lathe. You will need to confirm this. Measure the outside diameter first. If it is 3/4 then check the pitch. Start at the top of one thread. The distance to the next will be .100 of and inch. If I am correct on assuming your spindle size. Then that is what you will need with a 1"-8 thread on the outside of the adaptor. The main this you will need to know is what size is on you lathe. How do I determine if my lathe has a 1" x 8 TPI thread? BEST ANSWER: It most owner/operator manuals it will state what the spindle nose is on your lathe. If you don't have the manual, Most of them can be found on line with the manufactures name and model number in a goggle search. Last you can go to your machine and measure the diameter of the spindle. Best done with a pair of calipers. Taking care to be on top of the threads. The 1 inch is a theoretical diameter. There are tolerances that allow that diameter to vary. It should fall between 0.9980 / 0.9830" Then to find the pitch on a thread that is 8 threads per inch, often designated TPI. Lay a rule across the top of the threads. The points or top of the threads will be .125 or 1/8 of an inch apart. For other TPI of imperial designated threads. You simply divide 1 by the number of threads. That will inform you of the distance each thread should be at the top of the thread. That distance needs to be measured on the center line of the thread for accuracy. Measure the spindle and count the threads. If it is not a 1x8 you can buy an adapter. will this work on a 3240 WEN? BEST ANSWER: Did you transpose the model number? do you have a 3420? The 3420 has a 1'-8tpi spindle. This chuck is also threaded for 1"-8tpi. if you do have a different model. refer to your owners manual. Iy will provide you with this type of inforamation. You will also want to check on the morse taper of both the tail stock and the head stock. When you buy live centers and drill chucks. Or any other accessory that slide into those areas. If you do have the 3420. It has Morse taper 1 designated often as just MT1. Thanks, I am looking at getting the 3420 model and was wanting a chuck to go with it. I do not know. I ordered the chuck because I do a lot of turning and changing jaws takes quite a bit of time. It made sense to have two chucks on hand and the price was right. As a new to bowl turning, what advantage is there for reversing a bowl while turning? BEST ANSWER: The only real advantage for me has been sanding and finishing, no real advantage during the turning process. Happy turning and be safe. what country is it made? will this fit my Central Machine 40"x14" wood turning lathe model 67690? BEST ANSWER: I believe that your lathe has a 1" x 8 TPI thread pattern, which this Chuck will fit. Does the chuck actually have a dual Right Hand/Left Hand thread? I need a Left Hand thread for the outboard side of my lathe/spindle. BEST ANSWER: I don’t believe so. You can choose which one you are getting though. And then I had to buy an adapter for my lathe to work with this chuck. Will the pen jaws hold a 3/4” dowel, allowing me to drill a hole through the center of the dowel, end to end?